Mile 1353. Grant's Grove. Hard to believe we're going to see an even bigger tree in a few hours. The fallen trunk tunnel part of the trail is really cool. Mile 1354. We finally locate Shmoogie's park passport, lost for the second time so far, under my seat. Mile 1369. Entering Sequoia National Park! Mile 1376. "I hate physics," says Mr. P, who wants to be traveling faster. Mile 1386. 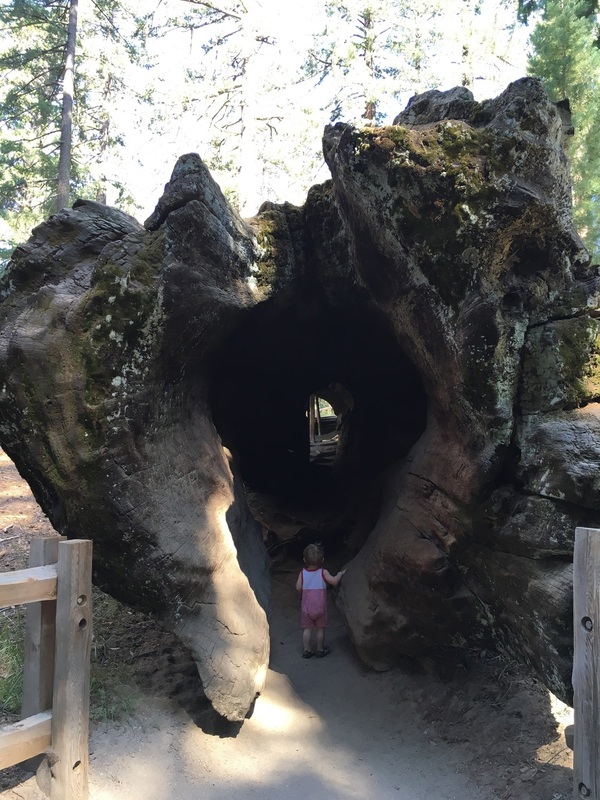 The kids are excited to climb a big rock, but first we're going to see the largest tree in the world! The forest service has very cleverly set this up as a steep trail from exactly the elevation of the tree top, so you get a sense of the scale of the thing. Especially effective while you're trudging back up with a toddler on your back and a 9 year old tugging on your hand and whining about how he doesn't want to do another hike. Mile 1390. We visit the Giant Forest Museum, are amazed, and decide that with nap approaching and a long drive ahead and tempers short, we won't take that 400-steps-carved-into-rock hike after all. No one is very upset about this at the moment. Mile 1398. Feeling a little carsick. Bayboh still awake. Mile 1401. Still with the impressive winding road going down down down. Twenty degrees hotter. Bayboh still awake. Mile 1406. Exiting the park. It's now 103 degrees outside. Bayboh is giggling like crazy because Shmoogie is being silly for him. Mile 1418. A big lake in dry country. It's a reservoir, you can see the tops of drowned trees sticking out of the water and rings of higher past water levels. Bayboh still awake. Not so happy. Mile 1421. Houseboats on the reservoir! Mile 1433. Bayboh seems to finally be asleep. Mile 1531. Field full of apricot (?) trees and pumps. Only one of the pumps seems to be working. 50 more minutes to chosen food stop. Bayboh still sleeping. Mile 1539. Looking back on the valley, it looks so green. Mile 1545. Passing the town of Caliente. It's way over 100 degrees right now. Mile 1558. The grown ups have a lengthy conversation about whether today is Wednesday or Tuesday. It's Wednesday. Mile 1560. A huge, beautiful wind farm! I love wind farms! Mile 1580. Bayboh's nap must end because this looks like about our last chance for food today. The wind is steady, strong, and hot. Shmoogie drops a marker getting out of the car and it lands so far under the car we can't reach it. By the time we get back, it's resting in a crack two parking spaces over. Mile 1582. Shmoogie is singing "The Wind is Called Mariah," her favorite song from preschool, since I called her attention to a hotel called Mariah. Mile 1622. Realize the funny looking tree things we've been seeing are Joshua Trees. Mile 1645. We cross what's labeled as the Mojave River. It has no water. It doesn't even have any mud. It's a slight depression barely distinguishable from the surrounding area. Wikipedia says most of its flow is underground most of the time. Mile 1677. Shmoogie's battery has run out. Luckily the view out the window is pretty interesting, with the sun getting low and cloud shadows besides. Mile 1717. I have finally knitted back all the yarn I ripped out the first day of this trip (row gauge wasn't what I'd expected, had to switch to an increase every 7 rows instead of every 6). Mile 1727. I wish I could still read in a moving car like I did as a kid. Gripped with a sudden desire to read all the SpriteKit documentation. Mile 1734. We're 72 miles from Las Vegas. We're not going to Las Vegas. Mile 1754. Bayboh says, "Out! Out!" Shmoogie says, "We're just letting Mr. P out because he really really needs to pee." Mile 1759. A tiny outpost in the desert. Beautiful sunset, some stars. I'm apparently the only one who couldn't sleep through the four freight trains running by 30 yards from our rooms.